Apart from the fact that it is simple to make and so good! This has become one of my favorite brekkie or dinner items due to one other main reason; my son doesn't eat eggs as such but this he devours! So this is a great way of including egg with veggies in your or your children's diet. I myself I avoid the egg yolk and prefer only the egg whites. 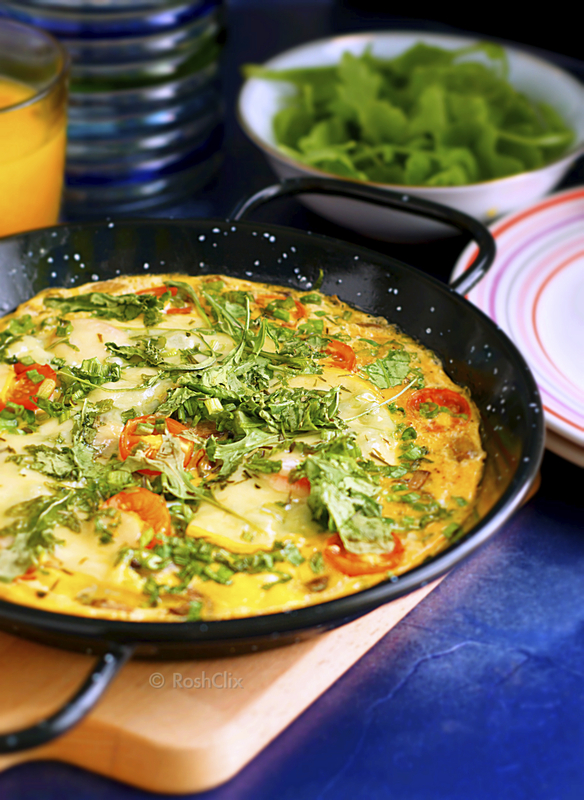 But with frittatas it is a different story ;) This is just a basic recipe that anybody can experiment with. Think of it as a crustless pizza and you can top it up with all your favorite ingredients. And it is definitely more nutritious and filling than a pizza! I always prefer mild gouda cheese for frittatas as I find it very appealing but you can easily substitute it with any cheese of your choice - mozzarella, parmesan, white cheese, processed cheese…just about anything. Cooking is simple and does not involve any particular techniques but you have to make sure you cook it on a low flame so that the egg does not get burnt at the bottom. I have read that left overs cane refrigerated to be used later but cold egg is not my kinda thing so I have never tried that out. Anyways we never have anything left overs as we all enjoy it pretty well :) Try it out and you may get addicted to frittatas like me! Lightly beat the eggs and milk. Season with salt and pepper. Keep aside. Warm oil in an oven proof (preferably non stick) pan and add the sliced onions and minced garlic. Saute for few minutes till they turn translucent. Add the sliced mushrooms, sprinkle some salt and fry on a high heat, stirring continually, till they begin to brown on the edges. Then add the beaten egg mixture and spread it evenly in the pan. Cook on a low flame. You can lift the edges gently with a spatula and allow the raw egg to run between and underneath. But be gentle, taking care not to scramble the whole mixture! When you see the edges beginning to firm, layer toppings of your choice - I used cherry tomatoes, rocket leaves, spring onions along with the gouda cheese slices. Switch off the flame. Place the pan in the oven and let it cook till the cheese begins to melt and the top surface of the frittata turn golden brown. Cut into slices and serve warm with bread and a green salad of your choice. 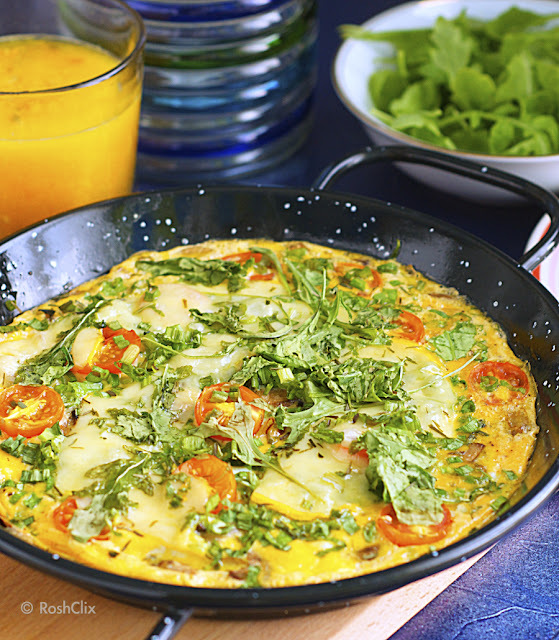 I love frittatas! I can't believe I haven't made a frittata in FOREVER!